Whether it’s a business workspace or a home office, clutter can quickly take over, reducing efficiency and profitability. To make matters worse unfiled documents create a security hazard, leaving you exposed to risks like identity theft and corporate espionage. Make your workspace cleaner and more secure with these decluttering tips. Look at every document. Is it essential? If not, get rid of it. Some documents, like tax records, need to be kept for a set period of time. Once that’s over, they’re gone! 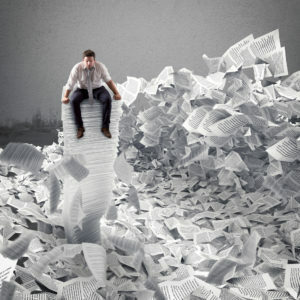 Many documents might be ‘keepers’, but don’t need to be in hard-copy form. Scan and upload them to a cloud service like Google Drive or Microsoft OneDrive. Regular decluttering will stop bad habits creeping back in and help you maintain a tidy, efficient and secure workspace. Schedule a daily tidy-up of your desk, and a monthly cleanout of draws and other storage areas. To eliminate the possibility of sensitive data falling into the wrong hands, ensure complete destruction of unwanted documents by using an experienced and professional document-shredding service. EShred provides an easy, flexible and secure document-destruction solution for both business and home. Our secure document bins (minimum two per order) are delivered by Australia Post. Filled bins are then picked up by secure transport and taken to an approved site where all documents are comprehensively cross-shredded into tiny fragments before being transferred to a recycling facility for final, total destruction. At the end of the process you receive a Certificate of Destruction, your guarantee that all data has been completely destroyed. Phone us today on 1300 629 875 to find out how easy and cost-effective secure document destruction can be.